If you have trees on your property, you will need professional tree care services to keep them healthy. As a homeowner, it’s your job to make sure that every part of your home and your property are well cared for. If you have trees on your property, you will need professional tree care services to keep them healthy. When you call the professionals at Nelson Tree Specialist, we can come out take care of whatever your trees need. 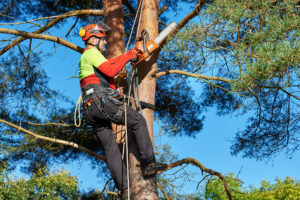 Here are some of the things a professional tree care company can do for your trees! Strong winds, heavy precipitation, lightning, and other storm conditions can cause extensive damage to your trees. A bad enough storm can even knock trees over completely. If you have a tree that has been damaged by extreme weather, Nelson Tree Specialist can come out and remove it. Tree trimming isn’t just for Christmas. The trees on your property need to stay properly trimmed in order to be healthy all year round. Trimming your trees is vital to their health. Lack of proper pruning can cause disease and sickness to spread, killing an otherwise healthy tree. If you want your trees to remain large and lush, you should have them trimmed periodically by a professional. Trees are living organisms, and as such, they can get sick. Regular trimming will go a long way toward ensuring your trees stay healthy. If your tree is ill, a licensed arborist may be able to treat the illness before it spreads. You can trust Nelson Tree Specialist for all of your tree care needs. This entry was posted on Friday, March 23rd, 2018 at 11:12 am. Both comments and pings are currently closed.